I make art to express what I can't find words for. It relaxes me, helps me loose myself into something magical, sometimes make me laugh and frequently unleashes the child in me ...who loves to have fun. Don't know how I would feel about it if I had to teach it. I hope I would encourage students to have fun while being creative. Thanks! Definitely for me it is fun to teach, and making art is fun, frustrating, focusing, distracting, exhilarating, all the things that an important endeavor can be. Fun is certainly part of it, but because I NEED to make art, I wouldn't say it's just for fun, for ME. And since it IS my work, it is not "for fun", but it IS fun. Many of my students are professional or serious artists who wouldn't characterize what they do as "just for fun", but still have fun doing it. Art is fun in retrospect. This is an interesting subject to think over. I personally tend to forget that many people do art only to have fun. It was the same for me when I was younger, but at some point in my path, it has changed and now I’m taking it probably too seriously even if I often experience pleasant and fun moment doing art. I think what "just for fun" means for many people, certainly for me, is the desire to release judgment, including self-criticism. So many classes (art and otherwise) in the typical person's history include feelings of having failed, especially when judged by someone with supposedly superior knowledge in a way that squelches creativity. You wouldn't do that -- it's clear from your courses and blog posts that you do encourage a playful (meaning nonjudgmental) attitude, but maybe some students entering your classes don't know you yet. I DEFINITELY encourage people in my classes to let go of the judgement and self-criticism!! But that is a huge challenge; judgement and self-criticism seem to be the auto-pilot mode, the default. I think you are right, though, that once you learn to just SEE what you are making, and FEEL what you are doing, it IS a lot more fun. Thanks for this thought! I often say in the class intro that textile is my thing and everything else is for fun; I never imagined it might sound offensive to some. I have been asked to explain further on occasion and my usual reply is, "I want my right brain to get some work out." Also, because I have difficulty living in the moment, shutting out the noises as it were, concentrating in the act of making, (in ways different from "work") helps me do that. In fact, going to different classes have helped me learn how to concentrate, (i.e. taking the time and thinking deeply,) in my work. As I've gotten older, I've also began to ignore instructions and do as I please, as whatever classes I take are "just my side things", as long as I don't disrupt the class. No wonder one teacher said having me in class is like pulling teeth. I must also note that there is oh-so-much more freedom in whatever we do here in New Zealand compared to my experiences in the US and Japan. And by the way, LOVE your work. Oh, I would love to take a workshop in New Zealand and see what you mean about the oh-so-much more freedom! Are people less self-critical? Do they value FUN more highly? I sometimes have people in my classes who are there just to do their own thing, and I try to honor that. Of course my default expectation is that they are there to learn what I am teaching, so it takes me a minute to perceive the difference between not-paying-attention or not-understanding-the-assignment, and doing-their-own-thing. I should put something in my pre-workshop e-mail about that. If someone says right up front that they are there just to do their own thing in the company of others, that would be fine. I'll give that some thought. Thanks. I take my painting very seriously but other art stuff I do just for fun. However, non-artists think it's serious stuff. I make books but I'm definitely not a bookmaker; I make dolls but certainly don't consider myself a doll artist and I make quilts but no way am I a quilter. I am a painter but even some of that is just for fun, that's where the experimenting comes in. Ha! I think that's perception v reality. If it is your no. 1 calling, then there are constant challenges, learning opportunities and multiple questions that arise for each one that becomes close to being answered. It is a never ending journey; there are many positive adjectives to describe this journey but "fun" certainly doesn't make my top ten. The fun part, for me, is when there is social interaction especially painting with a friend which I haven't done for years. Online - the fun part, the amusing part, can be reading the ups and downs of other and the witticisms that often pepper the observations that arise out of another "f" word: frustration. Another fun element can be playing with a new technique or material - at the point when you're not thinking about art but just playing. Again, the fun part is increased in a social setting. So how do you indicate fun in your courses? Possibly providing an opportunity to develop art skills in a fun environment. The photos certainly look fun. Now, I am thinking again that maybe each week that we should post one piece that was done just for fun (that doesn't require a written observation - 😂) maybe something that uses up the colours at the end, during a bit of playtime. I'm with you on your first point - fun is one of the things that art is for me, but it isn't at the top of the list. I do have a LOT more fun when painting in company, even while teaching. That is partly why my new studio is sized to accommodate two or three others! I LOVE YOUR IDEA of posting a piece "just for fun" in an online workshop!!! We could build a whole workshop around that.Make the "serious" pieces, the stuff that is assigned, and then post three more pieces that are Just For Fun. I think I can guess which pieces would be better. Hi Jane, loved this post mostly 'cuz I have had the same reaction when working a small workshop and when taking one. I would like to share your post on my blog also, not sure how to do that but can figure it out if I have your permission. Sure you can share it. Click on the title of the post, copy the link in your browser, and paste it into the link window in your edit window. That way you are sending people to the post on my blog, with all attending discussion. I think art making has to be fun. We need a reward for the time and effort we put in. The result is not always art, but satisfaction from manipulating art materials is a basic human need. The process is sometimes more important than the product. I totally agree with you that MAKING stuff is a basic human need. People experience it differently, depending on what kind of pressure or expectations they put on themselves. I loved that article - it gave me validation to just be in the moment and joy of a creative activity. Glad you accepted it as your problem - of course it should be fun and should include lots of learning and skill development. Other wise, I would go to a fancy art school to be graded and judged instead of taking a workshop. It's a hobby until its not...then its a "job, career, profession...." with all the pressure to perform (been there done that. Exactly!! Making art, especially in a workshop where you are asked to do unfamiliar things, is challenging, so I do try to make it fun also. Maybe I could try more assignments that have a group element to them - the social interaction may make it easier to let go of the self-criticism. I think when someone says they are doing your workshop 'just for fun', what they really mean is that they don't want to be criticized. I give workshops (pottery) and always deal with the fact that, as adults, our standards are often far ahead of our skills. I point out that children don't worry about that, they just go at it, and as adults learning something new we have to try to have that attitude too. You won't succeed (or learn) if you are too worried about 'succeeding'. Also, remember that play is life-practice. So if someone says they are 'just here to have fun', I assume they mean 'to play', and I'm happy about that. 'Playing' makes learning less painful, and encourages you to keep going. You have put that SO well! Our standards are so far ahead of our skills, YES! And especially in pottery, the learning curve is slow. Maybe next time someone says they are in a workshop "to have fun", I will simply ask if they want feedback, instruction, etc., if they want me to push them at all or just let them do their own thing. If someone is not engaging in the exercises I'm giving, then I generally give them less in-depth feedback. But I will pay attention to this and make sure I am still encouraging, and also try to get a better understanding of what they want from a workshop. Thanks. Perhaps the teacher could have a little Q&A note that she gives out at the beginning of class with that question: Why are you here? A. to have a good time doing something that's familiar. B.to learn new techniques to apply to my art practice. C. just to have fun for this time/day/week. Or a different set of questions: A. Push me B. Let me play C. Critique please. then students could group according to their purpose, or put the appropriate letter A-B or C on their name tag so you'll know when you talk to them. Yeah, I know... I'm too serious, but I've had the same experiences in classes I've taught and know how frustrating it can be when my attitude clashes with a student. After all, they are paying me good money to learn from me and I'm bent on giving them all I can. It's then frustrating when someone goes off on a tangent or two friends chat away while I'm teaching. The teacher HAS to approach her job seriously no matter what each student's purpose is for being there. Teachers need to lighten up a bit and be sure to bring humor into the classroom. If it's not fun for me, it becomes work and then I burn out quickly. My students have various needs and I try to accommodate them all. Some are there to improve their skills or learn a new skill; others to rub shoulders and minds with other artists; others are trying to identify or refind the creative part of themselves; others are "crafters" who want to "make" gifts or things for themselves; still others are lonely and seeking companionship and community; there are those who are self expressing; some are looking for something that helps them relax and is different than their everyday life; and then there are the wounded who are looking for healing. I'm sure there are more reasons. I'm a non-profit seeking to bring art to those who need it for whatever reason and at a reasonable price -- sometimes free. I have always had fun in every class that I have taken with you. But I take the class to learn, to stretch, to explore, to be challenged, to be pushed, to discover, to further my art practice. I would not want a class that was "just for fun" and I want the others in the class to be "serious" about their art as well. I welcome the feedback from you and the critiques with fellow students. That said, I also know many people who would thrive in a play based class because they are so afraid and they believe that they have no talent. As a teacher it is rewarding to lead these students to discover their creativity. As you wrote, I also NEED to make Art. Others may enjoy simply playing. Well, you are a MODEL student, Barbara! You push yourself, you take advantage of all the discussions, you try everything. Your comment "I want others in the class to be serious..." I take to heart. As much as I want to honor each person's reason for taking a class, I do want to foster a sense of learning and challenge, staying focused on the issues and concepts we are exploring. I think in general my workshop descriptions draw people who are really there to learn. But learning / being challenged are not mutually exclusive with fun, as you point out! I guess that is the balance I need to be aware of. I really do strive to get people out of the default judgement mode so that they can SEE what they are doing, and I hope that makes it more fun. I love all the comments above and can relate in a lot of ways. I think this question of yours jumped out at me: "Do I feel that "just for fun" somehow diminishes a practice that I take seriously?" especially from when I worked predominantly with fiber. Crafters often looked at what I did and thought they could do the same themselves. Yet many, many hours of learning and labor went into what I did, and I had my unique method, etc. So what looked like "fun" to them was my art and it did feel like they diminished that with their comments. But now I feel like I wish I could loosen up and be freer with my painting, since that's what drove me to painting in the first place. I'd like to figure out a way to convince my brain (lie to myself?) that I'm making art just for fun! I know what you mean! I think that now when people talk about painting as if it is "just for fun", or relegate it to the realm of "child's play", it makes me smile. Lucky me! I get to make a living just playing around with paint! I think art is communication. When I make greeting cards I am just having fun--and the communication is simply a "hi, I'm thinking of you, happy birthday." But when I am working on a serious piece, that communication is deeper, more complex. It is hard to put in into words, which is why I'm working with paint and paper instead. I think "intent" defines which we are choosing--just fun or "art," but we can have fun no matter which we choose. Hi Nan! Isn't that funny, though, that we do make a distinction. I don't make this distinction much in my own work because I rarely do things like greeting cards (burned out on that years ago, I think). Sometime I am asked if I approach my "real" art differently than the experimental stuff I demonstrate in classes. Nope. I think your point is insightful, though: we have levels of commitment or involvement, even if making a greeting card and making a painting are both "fun". Does doing art for fun or as a hobby have to be the opposite of doing art seriously? Are those the only two options? I came to art making late in life and I do it because I like the challenge of learning something new. I consider it a hobby because I have no desire to make any profit from art making other than the enjoyment of seeing what I can create. It is not the center of my life, it's not my vocation but an avocation. So I'm not sure if that means I'm doing it for fun or taking it seriously. Right. That is where this discussion has led me, too. Doing it for fun AND "seriously", or doing it seriously AND finding it fun: this seems to be how a lot of us characterize our art practices. No need to choose. Very intersting thoughts. I can totally see your point. When I take a workshop and say "I'm doing this just for fun", it's mostly to get my left brain out of the picture. I'm there to learn, explore, experiment and see what happens. I'm not there to create a masterpiece. It helps me stop the self-criticism and stay loose and open. But, I still want to learn whatever techniques are being taught and bring them home to see how they might fit into my art practice. Sometimes they do and sometimes they don't... and that's ok! EXACTLY!! I think most of us who practice art either as a leisure activity or as our main endeavor, find it both fun and challenging. We enjoy learning, so going a workshop to learn something new IS for fun, and for other rewards as well. I don't really think that anyone is belittling the practice of painting when they describe it as "for fun", or as a hobby. The article is about our seeming inability to relax with our leisure activities, that we make our hobbies into goal-oriented, that we put pressure on ourselves to be good at them. But it DID get me thinking about the role of "fun" and "play" in the serious (AND playful) endeavor of making art. Art requires Play. I think. I'm just hypothesizing and seeing how my attitude - "just for fun" or "making a series" or "investigating what I can do with neutrals and line" - affects my studio practice or my work. This discussion is so relevant for me as I’ve just had two gallery shows back to back (really my first) at the same time as I was taking your “100 Cheap Drawings” online class. Part of what I noticed as I was creating art for the shows was less spontaneity, more judgment, especially around “What will people like?” instead of my more basic reason for making art, which is a joyful compulsion to take in the world around me in terms of color, shape, form, line, mark and essence, and express that freshly out of my own sense of being. It's taken me a couple weeks to reconnect with that more basic impulse, and I’m glad it’s still part of me! And while there is really so much “work” involved with making art, that too is part of the exploration of broadening my boundaries, challenging myself both artistically and with things like deadlines, commitment, tenacity, and the like. I’m right now appreciating that phrase that popped out above of “joyful compulsion. “ I would love those qualities of joy, wholeheartedness, interested curiosity to come through for people viewing my art, and of course, I can’t make that happen consciously. But in the end I do see art as a sort of transmission between maker and viewer. Maybe “just for fun” could be a way of saying all of this, and sometimes it even goes further to “just for the doing of it”. Ha! "100 Cheap Drawings" is a good name for the class. I know what you mean, though. EXCELLENT point! As soon as you are making work FOR something, for a show for a client for a gift, whatever, it changes your process. Getting back to that "just for fun" can be a way of getting back to the Joyful Compulsion. Great wording! Thanks for this comment, Jan.
For the last four years I have worked in a public art space where the artists are juried in and the studios are all open to visitors all of the time. I get the “It must be nice to have fun all the time at work!” Frequently. Well running your own business isn’t fun. It’s hard work. And so is making art. I do it because if I don’t I am miserable to live with. 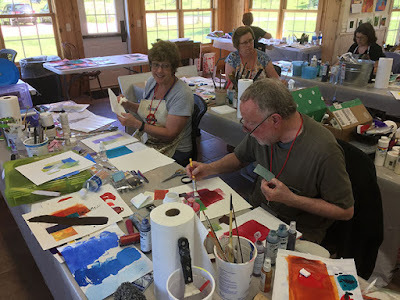 There are workshops I take “for fun” , usually art journaling workshops where I can let go and be chatty or just let the process do it’s work healing me. In general I do have fun in workshops and classes where I let myself work without too much of the inner critic. It’s nice and fun working with other people. But it’s never just for fun. I do it because if I need to grow and challenge myself. There is a place, I think, for offering workshops that are just for fun, the sort of make and take workshop. But that kind of workshop doesn’t need to be taught by everyone. Now that I am moving into a large atudio space close to home and plan to offer workshops there, I have to think about my clients and their needs when considering what to offer. And make and take will be part of that!